Use our FREE Childcare Log template to record a child's food consumption (bottles,) naps, milestones, and medicine. This log can be used by babysitters or daycare providers. Enter the child's name into the spreadsheet, and then print the template. 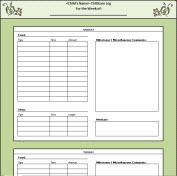 The template will print on three pages and offer a log section for each day of the week. As the week progresses, record activities on the template. At the end of the childcare session, provide the template to the child's parent/guardian.